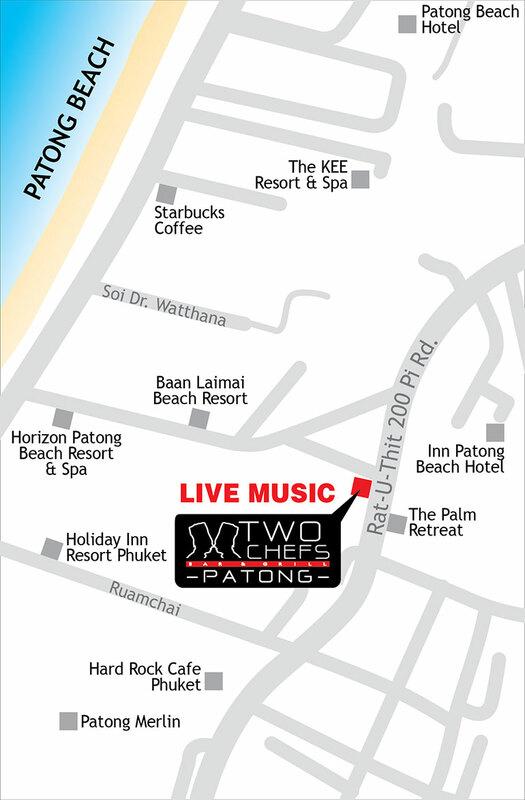 TWO CHEFS Thailand are very excited to announce our newest location in Patong! Our hot new restaurant is located at the center of vibrant nightlife, hip culture, and in the heart of one of Phuket’s finest beaches. Join us at our newest location only 5 minutes from Patong Beach. Come surround yourself with LIVE MUSIC EVERY NIGHT from 8-LATE performed by our Famous Two Chefs Band. Patong isn’t one of Phuket’s hot spots without reason! Enjoy perfectly mixed cocktails, unforgettable dishes bursting with flavor prepared by our professional team of creative minded chefs, delightful desserts, and more! Our dishes are inspired by both international and local cuisine. Don’t miss our EXCITING WEEKLY EVENTS. It’s no secret we’re known around the island as one of the hippest places for nightly music and outstanding food! Our first Two Chefs location opened in 2000 and we’re still rocking Phuket! Come join us today!